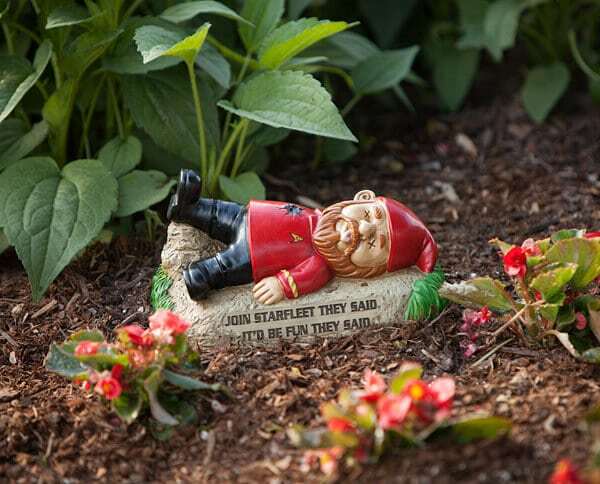 Are you tired of the classic gnome garden statues that you see in nearly every garden in your neighborhood? Do you want to decorate yours with something more creative and unique? Luckily, you are not the only one who has thought of this. That is why you can now purchase all sorts of creative garden statues to use as ornaments that will definitely draw everyone’s attention. Just to give you an idea of what you can find, here are 3 types of garden statues that will make you chuckle. If you aren’t simply tired of garden gnomes, but you truly want to make a statement against them, this statue will definitely amuse you. As the name suggests, it depicts a scene in which a dinosaur destroys a bunch of gnomes by feeding on them or stepping over them mercilessly. You can purchase this one from Amazon for $24.99 and make sure your garden will be the center of attention. It is weather resistant, so you can place it in your garden and not worry that sun exposure or rain will damage it. Moreover, it can make for a really funny gag present as well. 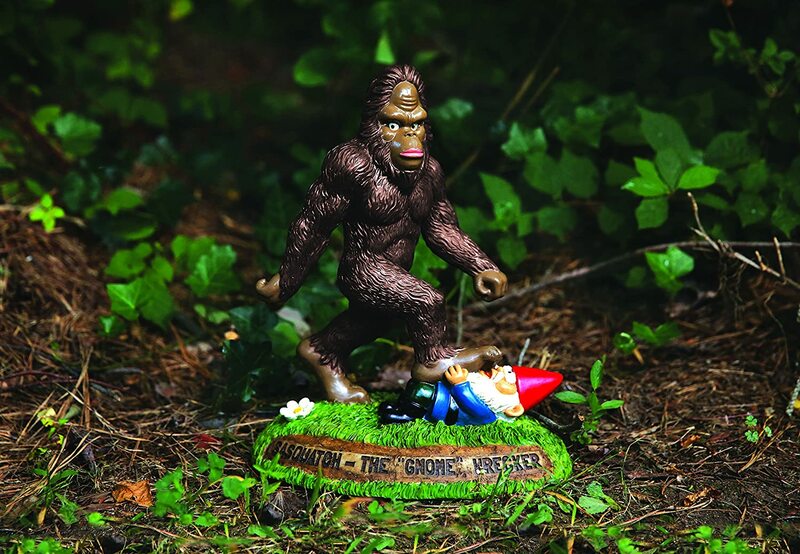 Speaking of gnome massacres, another similar garden statue that you can find on Amazon for $29.99 shows Sasquatch stepping on a terrified garden gnome without thinking about it twice. The statue is 9 inches tall and it is made of resin. It is definitely weatherproof and extremely detailed at the same time. Moreover, the details make for a funny take on what people usually like to decorate their gardens with. Think about it, how many people do you think have a Sasquatch stepping on a gnome in their backyard? 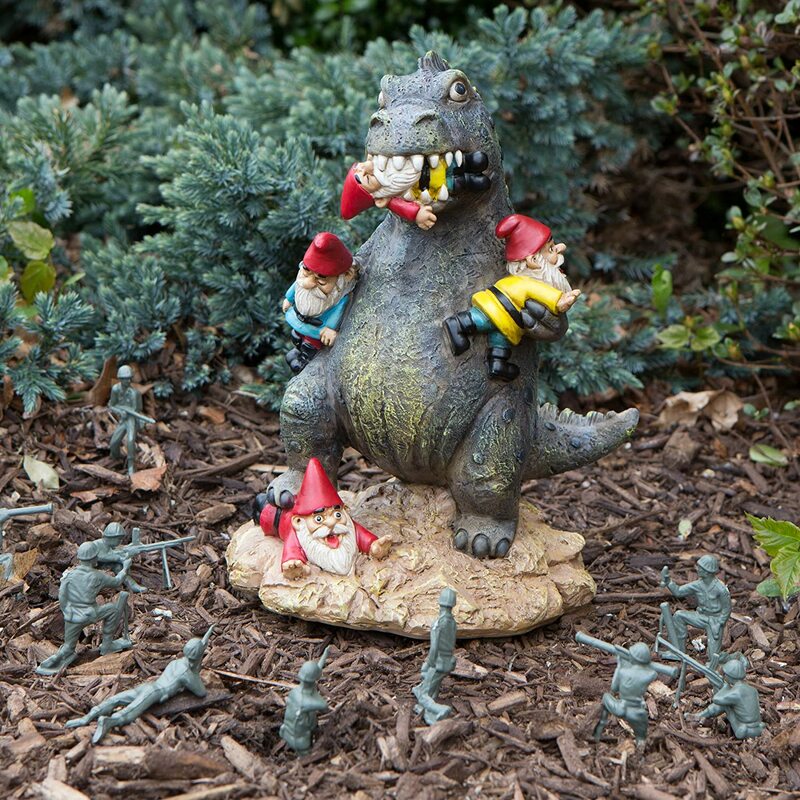 Make sure to let everybody know you are over the traditional gnome garden decorations with this creative and hilarious idea. Did we just say garden gnomes are overrated? Well, yes, that’s true, but not when we’re talking about a Game of Thrones inspired gnome. Yes, you heard that right. 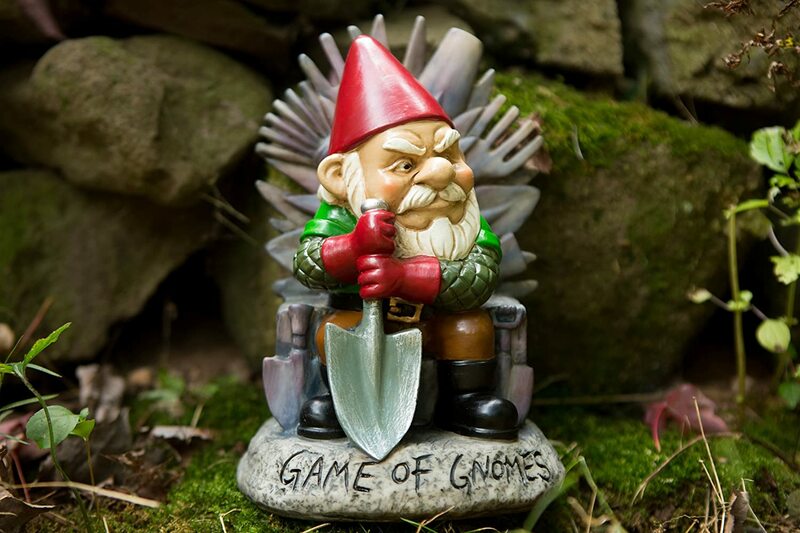 You can now purchase a garden ornament of a gnome sitting on the famous Iron Throne. The truly hilarious Game of Gnomes twist is bound to make any Game of Thrones fan chuckle. The gnome is painted by hand, which will become quite obvious once you look at his extremely detailed and lifelike features. The entire construction is 9.5 inches tall. Moreover, it will stand any type of weather, so you can safely place it in your garden no matter the season. Or you could buy it for a friend who you know will appreciate a gag Game of Thrones-related present. We know we had a lot of fun exploring these creative garden statues ideas. We hope you did too while reading our short guide. Consequently, if you are sick of the traditional gnome statues, make a bold statement by purchasing one or more of these funny options.